Henry Vincent (37) died after a struggle with Richard Osborn-Brooks (78) at his home in Hither Green. Iain Gordon pulls the flowers down from a fence opposite the house of Richard Osborn-Brooks in South Park Crescent in Hither Green, London. POLICE IN LONDON have urged the public to respect floral tributes hung near the house where a burglar was stabbed to death, after they were removed by neighbours. Henry Vincent (37) died after a struggle with Richard Osborn-Brooks (78) at his home in Hither Green in south-east London last week while he was allegedly burgling the older man’s home. Osborn-Brooks was arrested following the incident, but police confirmed last week that he will not face criminal proceedings, following consultation between the Met and Crown Prosecution Service. 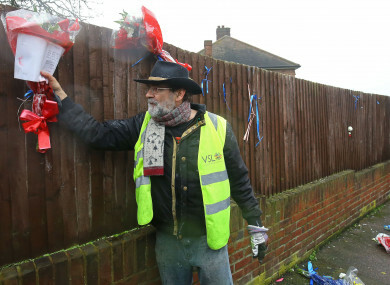 Now The Guardian reports that a three-day standoff between Vincent’s family and local residents of Hither Green continued today after a neighbour pulled down 16 bouquets from the fence where they had been displayed. According to the The Guardian the family – who said that they were Gypsies – said they were being treated differently and that they wanted to remember Vincent as “a good man”. In light of the tensions, Chief Superintendent Simon Dobinson with London Met Police today said that he was aware that concerns had been raised over the tributes. “My officers have a responsibility to provide reassurance to local residents so they can go about their daily lives, while also respecting the wishes of family and friends to mark the loss of a loved one,” he said. “They are not there to safeguard or facilitate the laying of floral tributes; we are liaising with the local authority who are considering appropriate management of the floral tributes. Dobinson urged members of the public to “respect the wishes of those who choose to place flowers and other tributes in the area”. “We would also request those placing tributes or visiting the area to behave in a responsible manner so as not to disrupt the local community,” he said. “A small police presence remains in place in and around South Park Crescent to provide reassurance to the public. There have been no arrests. Officers will assess any potential criminal offences including any allegations that are made to police, which will be dealt with in a fair and appropriate manner on an individual basis. Email “London police urge public to respect floral tributes near home where burglar was stabbed to death”. Feedback on “London police urge public to respect floral tributes near home where burglar was stabbed to death”.